Home | Blog | On the field and on the court: What are symptoms of concussions? Almost half a million kids are treated in the ER each year for traumatic brain injuries, including concussions, according to the Centers for Disease Control and Prevention. That’s enough to fill more than 5,000 of the nation’s largest school buses to capacity. 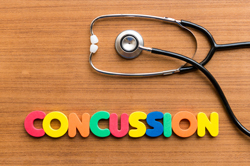 Research shows that young children and teens are more likely to suffer a concussion and take longer to recover than adults. Athletes who have, at any point in their lives, had a concussion are at an increased risk for another concussion. Recently, USA Football tackled the issue with an initiative called Heads Up Football. In July, the organization hosted an interactive class for local coaches in Gettysburg, PA. But it’s important to note football is only one sport during which symptoms of concussions may occur. From soccer to basketball and baseball, coaches and athletes need to know the symptoms of concussions whether on the court or on the field. Require players to wear helmets when applicable. Not all sports provide this opportunity, e.g. basketball, but when possible, wearing a helmet can help protect athletes from serious brain or head injuries. KBG Injury Law specializes in helping those who have suffered head injuries. Contact one of our skilled attorneys 24/7 to get the Results You Deserve®.